Venus on May 13 as of 8:40 p.m. local time from mid-northern latitudes. It is unmistakably bright, so a map is not really needed. The planet will be slightly higher in the sky each night at the same time. Since the end of January, the planet Venus has been on sort of a winter and early spring sabbatical. It passed superior conjunction (appearing to go behind the Sun as seen from Earth) back on March 30. Since then, it has been invisible, mired deep in the brilliant glare of the Sun. But with each passing day, Venus has been moving on a slow course toward the east and pulling away from the Sun's general vicinity. Finally, during early May, it has begun to emerge as an evening "star" very low in the western twilight. On the evening of May 13, it sets 27 degrees north of due west (10 degrees is roughly equal to the width of your fist held at arm's length) nearly an hour after sunset. By June 1 this will have improved to 80 minutes, giving even casual observers their first view of the famed "Evening Star." It's so bright that it can be spotted even through twilight very low in the west-northwest 45 minutes after sunset, so look early, preferably with binoculars. Appearing as a brilliant white star-like object, our sister planet will adorn the western evening sky through the remainder of this year. Unfortunately, for most Northern Hemisphere observers this is going to turn out to be a rather crummy evening apparition of Venus, especially during the summer months. The reason for this lies in Venus' placement in the sky relative to the Sun; from June 19 through December 8 Venus' will appear to have a more southerly declination than the Sun. As a consequence, it will appear unusually low to the horizon right after sunset, especially through most of this summer. On July 1, for example, for those living at or near 40 degrees north latitude, will see Venus set just 1? hours after sunset. 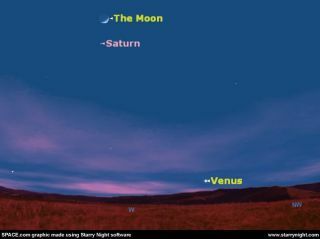 At mid-twilight, it will appear to hover only about 6 degrees above the horizon. By August 31, this situation will have not improved much at all, as Venus will still be setting only 1? hours after sundown and at mid-twilight will stand only about 8 degrees above the horizon. This also means that at no time through July and August will Venus be visible against a completely dark sky, as it will set before the end of evening twilight. (In contrast to these poor viewing conditions, Skywatchers in the Southern Hemisphere will see Venus pull well away from the Sun and gradually soar progressively higher in the evening sky during July and August. By the end of August, in fact, Venus will be setting more than 3 hours after the Sun and will appear more than 20 degrees above the horizon by the end of evening twilight). 1) Venus will be getting brighter as it rounds the Sun and speeds toward Earth. 2) Twilight fades faster in the fall than in summer, leaving Venus to shine in a darker sky; by mid-September, Venus finally sets just after the sky has become completely dark. 3) Venus will shift over from the west to the southwest. Objects at a given altitude above the horizon in the southern part of the sky take longer to set than objects at the same altitude due west, so the difference between the setting times of the Sun and Venus will ever so slowly increase. On Oct. 1 Venus will be setting 1? hours after the Sun, but this improves noticeably to nearly 2? hours by Halloween. Venus reaches its greatest elongation - its greatest angular distance - 47 degrees to the east of the Sun on Nov. 3. It is brightest in early December as it heads back down toward the Sun, reaching its greatest brilliancy for this apparition on Dec. 9 at a dazzling magnitude of -4.5 (smaller numbers are brighter on this scale, and negative numbers are the brightest). By then it will be an eye-catching sight in the southwest sky for at least a couple of hours after sunset right on through the Christmas season. Venus then quickly fades, vanishing from view in early January 2006, and passes inferior conjunction on Jan. 13. Within a week it reemerges as a morning "star" in the southeast. Between now and early January, repeated observation of Venus with a small telescope will show the complete range of its phases and disk sizes. The planet is now virtually full (98-percent sunlit on May 13), and appears as a tiny, dazzling disk. It will become noticeably less gibbous by late summer. In early November, Venus reaches dichotomy (displaying a "half moon" shape). Then, for the rest of the year it displays a large crescent as it swings near the Earth. Indeed, those using telescopes will note that while the Earth-Venus distance is lessening, the apparent size of Venus' disk will grow, doubling from its present size by Oct. 11. When it has doubled again in size on Dec. 7, its large crescent shape should be easily discernable even in steadily held 7-power binoculars.